Returning to Australia after nine months of travelling has been a bittersweet transition. The joys of reuniting with loved ones and the comforts of a reliably clean bed and shower have been peppered with pangs of panic as I face the blunt honesty of domestic routine and real-world responsibilities. While I’m a little sad to realise that my daily life won’t involve a new country, language or culture in the immediate future, I’ve got to admit that I’ve had it good. I have also relished the chance to share my travel memories with friends and family here at home. All this reflecting about travel has had me thinking how fortunate I am to have such a diverse collection of travel memories, which constantly offer solace and perspective in my everyday life. Every memory inspires me more to keep travelling, keep learning about the world, keep talking to people about their adventures and keep taking the plunge into new, foreign lands. So, to recognise the importance of memories, I’ve decided to launch a new blog series called Travel Moments, where I will share a brief memory, a sensation or perhaps a realisation from my travel adventures. 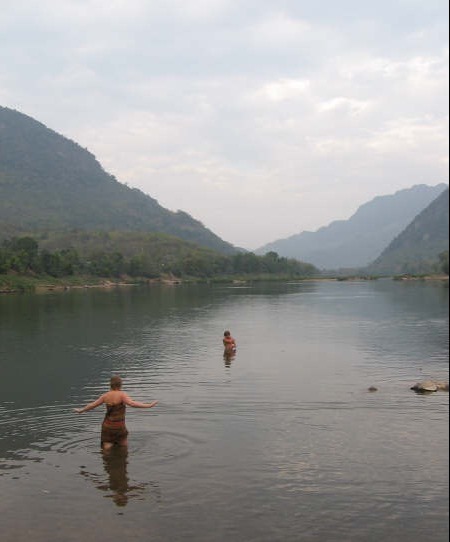 To start the series, I would like to take you to the Nam Ou, a peaceful river that ribbons through northern Laos. The glassy surface ripples gently as I tentatively dip a toe, causing blue mountain reflections to warp before my eyes. It is very still and quiet here by this riverside village in northern Laos. With the exception of a panicked chicken being pursued by village children, and wood fire smoke drifting in the dying light, there is barely a hint to help shrug the feeling that I’m standing in a painting of an ancient, untouched land. Gliding further into the Nam Ou, my sweat-beaded skin feels the chilly transition from tropical air. It is a comfort to float in the waters that I have been watching all day from my little wooden bench in a slow boat. This morning, I was navigating to the bustling docks in Luang Prubang as thousands of orange-robed monks returned to their temples to share the alms collected at dawn. The river was lively then, thick with handmade canoes and lined by fishermen preparing for the day. By lunch, the river had become cheeky, whipping and swirling around eddies and rocks, snagging our boat and casting us onto a sand bar to perform ad-hoc repairs. And now, as I float into the dusk-purple waters, the river is humble and calm, inviting me to know it’s peace and share a little of the wisdom that it has gathered over millions of years. Although I’ve travels many countries since my solo adventures through South-East Asia, the serene beauty and colourful character of Laos, Thailand, Cambodia and Vietnam has kept that corner of the world within my list of favourite travel experiences. Also, stay tuned for more stories from my 2012 year of European travels. Next, I’ll be sharing my story of sunny adventures on the Croatian island of Pag. Thanks Jen. As always, I appreciate your comments. I understand the need to escape into memories and stories and pictures of faraway lands – doing this is one of my greatest quiet-time joys. I’m so glad to share my inspirations and motivations with you, and other fellow travel-lovers. Thanks KD! What a wonderful compliment! Thank you for reading and sharing! Travel Moments are a great idea! We’ve been back from our 2nd RTW for 7 months, and talk about our memories, reflections, and “moments” between us, but sharing them with others is so much better! We look forward to reading more! Thanks Turtletravel, glad you think so. Reflecting, remembering, reminiscing are some of my favourite things to do, and a wonderful way to help the transition back into the non-travelling routine. 2 RTWs! I’m impressed. How did you find returning each time (if you don’t mind me asking)? Every time I come back I feel energised, and like I will slip into the ‘real world’ more smoothly than the time before, but it is a bit of a tough gig some days. I came back to your page after so long. And there’s so much to catch up on. Croatia looks so wonderful. It has never crossed my mind to travel there, but I’m going to think about it now. Travel Moments sounds so exciting to read. You’ve definitely inspired me into traveling more. Can’t wait to get reading and traveling of course.